in my opinion, both Kilroys and Cookie were past their prime by this point. The earlier issues are much more imaginative. that's a very astute comment which sadly applies far and wide on some of the early 50's comic productions. We already saw that early Buzzy was better than 1952 Buzzy, early Kilroys and Cookie were better than 1952 same titles. BobP reminds us that early Porky Pig, Bugs Bunny are better than 1952 PP and BB. I know the early Mighty Mouse was better than 1952 Mighty Mouse. 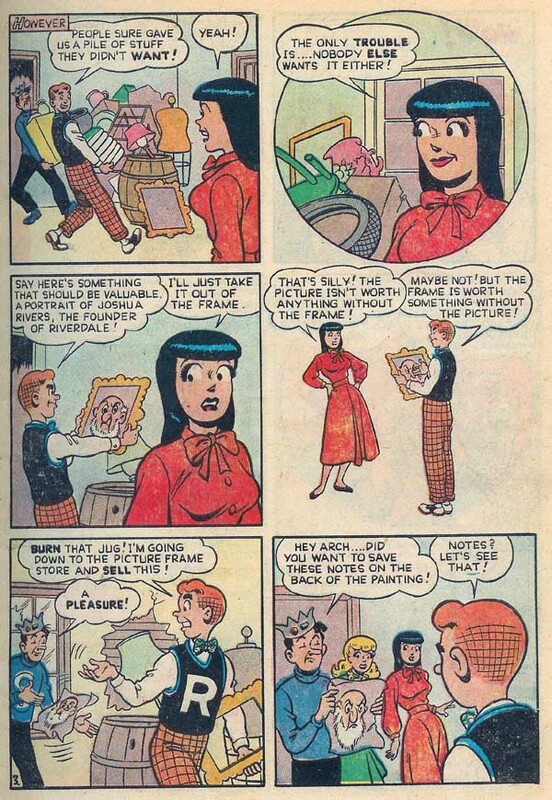 143 could tell us about the Archie titles. I have not read enough 40's westerns yet to see if earlier westerns are better. Our resident Lev Gleason expert could confirm for us that earlier Lev Gleason is better Lev Gleason. Overall, there certainly was a decline in the quality of the product, especially for genres that had been going on for longer. Younger genres like Horror and Sci-Fi had not mined to death the limited story-lines one could expect a comic writer to churn out. I'd love to hear others opinions about areas I might have forgotten or disagreements. I'm reasonably sure that's by Samm Schwartz, but the rest of the story would help to confirm. The balance of the page count in this issue is covered by many game pages all drawn by Martin Naydel. Michelle Nolan in her notebook entry from CBM # 110 notes that "[...] the first transition title in DC's history was Leading Comics, and the shift was from a "second-string" super-hero team, the Seven Soldiers of Victory, to funny animals with # 15 (Summer 1945). The change apparently was a significant success, since Leading ran for a full decade through # 77 (Aug/Sept 1955), usually featuring Peter Porkchops. 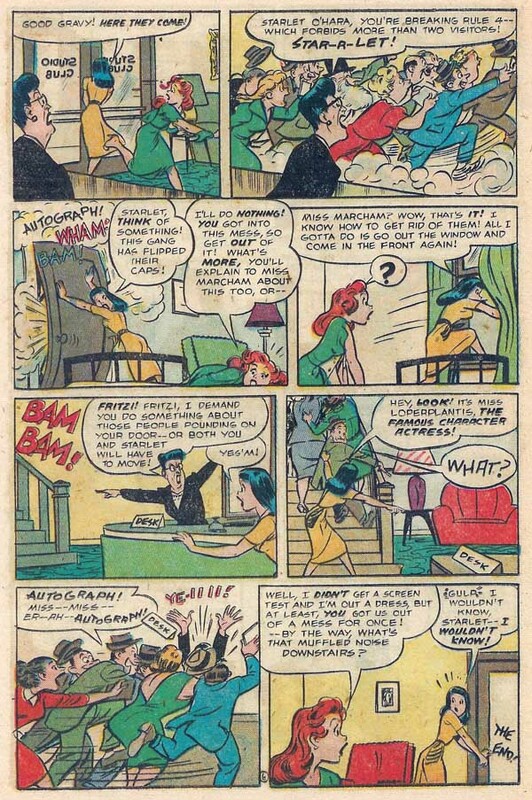 DC waited 3 1/2 years to make a similar transition with Comic Cavalcade # 30 (Dec 1948 - Jan 1949). By that time, the company had already been publishing five well-established funny animal titles - Funny Stuff (led by The Dodo and the Frog), Real Screen (featuring The Fox and the Crow), Leading (Peter Porkchops), Animal Antics (The Raccoon Kids) and Funny Folks (Nutsy Squirrel). Comic Cavalcade became DC's sixth funny animal title, featuring characters plucked from the other five. They included almost all of the funniest folks except Peter Porkchops who never appeared in Comic Cavalcade. 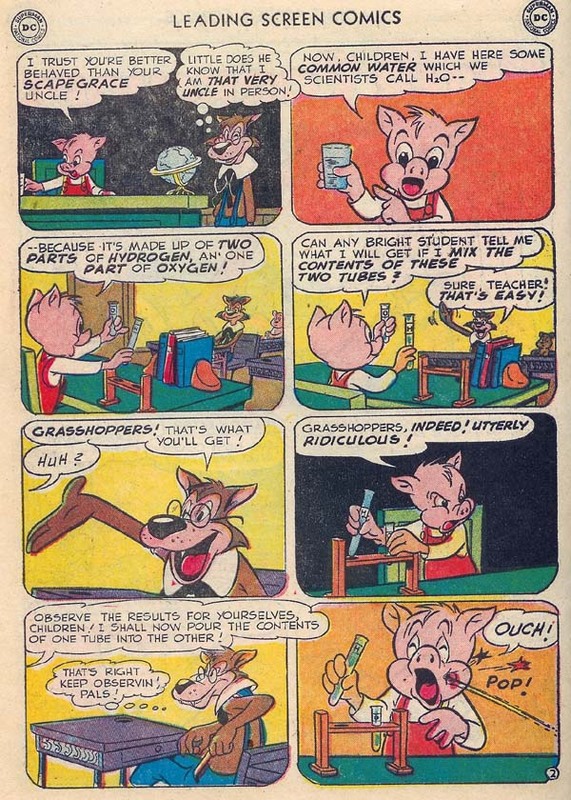 Including Peter Porkchops # 1 (Nov / Dec 1949), DC published no fewer than 42 funny animal comics in 1949! That represents nearly 20 percent of the company's 229 issues published that year. Somebody must have loved this funny stuff!" 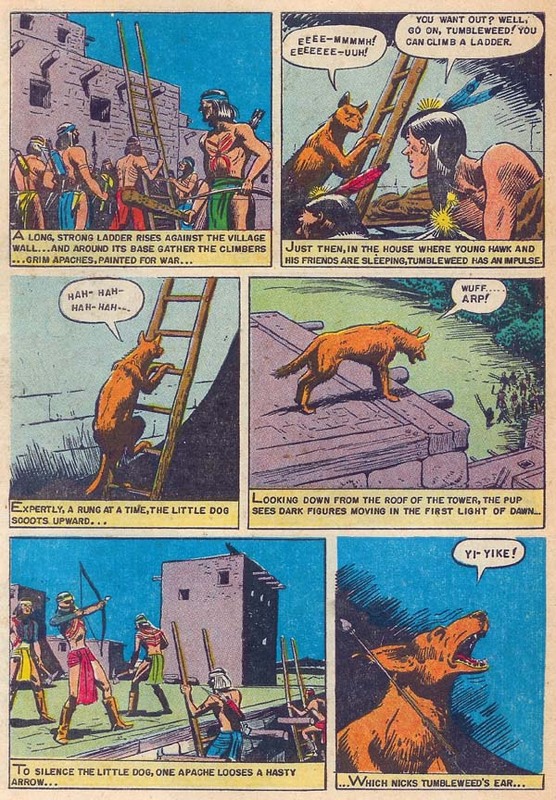 "Another switch occurred in the 23rd issue (March, 1947) [of Leading Comics], when Nero Fox (the jive-jumpin' emperor of ancient Rome) lost his position as the cover-featured first story of each issue, and was replaced by Peter Porkchops. That fun-loving pig was destined for success — about as much success as any DC funny animal ever had, unless you count The Fox & the Crow (which DC didn't own). The fun Peter especially loved was playing merry pranks on his next-door neighbor. "A. Wolf" was the name on the neighbor's mailbox, but Peter called him Wolfie. Of course, Wolfie usually merited Peter's unkind treatment because he was sneaky and underhanded and always trying to get away with something dishonest. But at least, unlike many of his brethren at Disney and Warner Bros., he never tried to eat his succulent little pal. Peter Porkchops was created by Otto Feuer, for years one of the mainstays of DC's funny animal line. Feuer is also known for Raccoon Kids and The Dodo & the Frog. The story may have been written by Sy Reit (Three Mouseketeers, Casper the Friendly Ghost), but this is less certain. 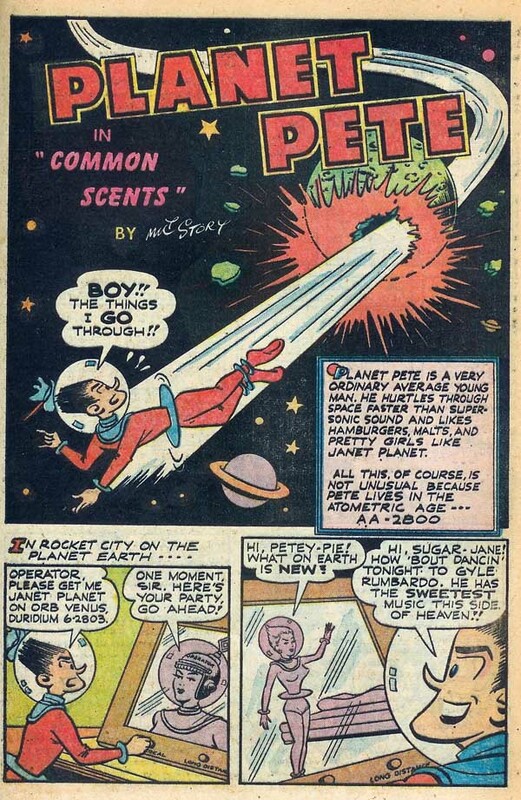 Feuer, at least, stayed with the character for years, not just in Leading Comics but also in Peter's own comic book, which started with a December, 1949 cover date. Feuer also did several one-page public service ads with Peter as their star, which ran throughout the DC line during the 1950s. As the '50s wore on, DC's funny animal line ran out of steam. Leading Comics (retitled Leading Screen Comics in 1950) ended with its 77th issue (September, 1955), and Peter Porkchops with its 62nd (December, 1960). Except in very occasional reprints, the character wasn't seen again for a couple of decades. When he did come back, he was completely different. In a free promotional insert in DC's Teen Titans #16 (February, 1982), he became a superhero — Pig Iron, a member of Captain Carrot's Amazing Zoo Crew. The Zoo Crew, with Peter "Pig Iron" Porkchops in every issue, remained in production for a couple of years. Even Wolfie turned up once, as a villain. But Captain Carrot, too, has been gone for a couple of decades now. DC doesn't seem interested in Peter Porkchops in either of his forms, nor in any of its other funny animal properties." "With superheroes, the first big fad of American comic books, losing their grip on the reading public of the mid-to-late 1940s, publishers were trying all different kinds of comics in search of the next big thing. MLJ Comics was having such success with teenage humor, it renamed itself after its most prominent character of that type. DC Comics, which was already publishing a comic about a "hep cat" named Buzzy, continued in that direction by doing something it had never done before — launching a brand-new character in his own comic. Leave It to Binky, starring a teenager named Bertram "Binky" Biggs, who had never hitherto been seen, started with a cover date of March, 1948. Binky's first issue — which, by the way, predated television's Leave It to Beaver by just under a decade — was written and drawn by Hal Seeger and Bob Oksner, respectively. Seeger's fame was mostly in animation, as producer of ABC's Milton the Monster, the syndicated Batfink, and more. Oksner worked mostly in comics, and was responsible for DC's Super-Hip as well as his own syndicated newspaper comic, Miss Cairo Jones. But Seeger and Oksner were working with a character that had been extensively developed by editor Sheldon Mayer, whose contributions to DC Comics run the gamut from The Justice Society of America to Doodles Duck. Binky wasn't quite America's Typical Teenager, a title then held by Harold Teen. But using the phrase as a description rather than a title, he was about as typical as Harold. He had a dog named Dopey, an older sister named Lucy, a girlfriend named Peggy, a rival named Sherwood, and a kid brother named (or at least called) Allergy. He went to a typical high school and was part of a typical family, with the possible exception of having a rich uncle named Snootly, who was also his dad's boss. He went on his typical way, as part of a group of teenage protagonists that included not just Buzzy and A Date with Judy, but also Here's Howie, a revival of Mayer's Scribbly, and a couple of others. In addition to his own comic, he also, like Superman and Peter Porkchops, appeared in public service ads throughout the DC line during the 1950s. Leave It to Binky ended with its 60th issue (October, 1958), by which time the superheroes were starting to give signs of a comeback. They did come back, and dominated comic books over the next few years. But by the middle '60s, some comics industry people thought they were fading away again, and a revival of the teenage genre was starting to look good. Accordingly, DC first launched a similar set of characters in Swing with Scooter, then devoted the 70th issue (October, 1967) of Showcase, the try-out magazine where The Flash, The Spectre and others had earlier been revived, to reprints of Binky. From there, Binky moved back into his own comic — Leave It to Binky #61 was dated July, 1968. Including a title change to just plain Binky, and a brief hiatus in 1970-71, it ran until #82 (Spring, 1977). In 1969 and '70, it even had a companion title, Binky's Buddies. Since then, the superheroes have steadily held sway, with the teenage market niche pretty much monopolized by Archie Comics. The odds of DC again reviving Scooter, Buzzy, Howard, Binky or any of its similar properties appear slim." P.S. : 143, here's another page from the Laugh story. Does it help clinch this as by Samm Schwartz? Oh, and could you tell us which bits helped you ID Samm? Thank you. There's plenty to say about both Li'l Abner and his creator Al Capp, née Alfred Gerald Caplin. Because addressing their histories, we need to recall that Toby's publisher was Elliot Caplin, Al's youngest brother. There was also brother Bence and sister Madeline in the family. Trying to avoid the Toonopedia for once, I copy the bios from lil-abner.com, where else? "Cartoonist Al Capp (1909-1979) created "Li'l Abner," regarded by many as the greatest comic strip of all time. He was born Alfred Gerald Caplin in New Haven, CT. At the age of nine he lost his left leg in a trolley accident. Encouraged by an artistic father, young Alfred developed his own cartooning skills. At 19, he became the youngest syndicated cartoonist in America, drawing "Colonel Gilfeather," a daily panel for Associated Press. But, bored with the staid and formulaic Gilfeather, Capp left AP and soon was ghosting the popular boxing strip "Joe Palooka" for Ham Fisher. But Capp found the working conditions in Fisher's studio intolerable. Capp's celebrity admirers ranged from actor/director Charlie Chaplin, writer John Updike and economist John Kenneth Galbraith. Author John Steinbeck was not only a fan, in fact, he called Capp "the best writer in the world." Capp speckled his wild narratives with unforgettable characters - among them heartless capitalist General Bullmoose; human jinx Joe Bfstplk, who was followed by his own bleak rain cloud; Evil Eye Fleegle whose double whammies could melt skyscrapers; cave-dwelling buddiesLonesome Polecat and Hairless Joe who concocted Kickapoo Joy Juice, the ultimate moonshine; Mammy Yokum, the sweet old lady who could outbox men twice her size; fumbling detective Fearless Fosdick, whose bullet-riddled body resembled Swiss cheese; and the gorgeous but odorous Moonbeam McSwine who preferred the company of pigs to men. And when readers thought there was no sadder and poorer place than Dogpatch, Capp would take his readers to frostbitten and poverty stricken Lower Slobovia. It is no surprise that the colorful Li'l Abner cast inspired a long-running Broadway musical in 1957 and two film adaptations. In addition to the enormous popularity of his comic strip, Capp's fame stemmed from a high media profile. He was a frequent and outspoken guest on the "Tonight" show, spanning hosts Jack Paar, Steve Allen and Johnny Carson. He authored his own newspaper column and radio show and was a guest lecturer at campuses nationwide. Capp retired the strip in 1977 and died two years later. Capp's "Li'l Abner" stands the test of time as a pinnacle of cartoon art and social satire." Coulton Waugh also recalls to our attention that Capp would base his characters' features on real people such as Henry Wallace (Li'l Abner), Veronica Lake (Daisy Mae), Fiorello La Guardia (Marryin' Sam), Bernard Shaw (Adam Lazonga) and Winston Churchill (Adorable Jones). "Li'l Abner was the title character in the long-running (1934-1977) syndicated newspaper strip by cartoonist Al Capp. Hardly "li'l," Abner was a hulking, naive man-child, and the frequent foil for Capp's satiric stories about American life and politics. This simple-minded citizen of humble Dogpatch was a paragon of virtue in a dark and cynical world. Abner often found himself far from home, whether in the company of unscrupulous industrialist General Bullmoose, in hapless snowbound Lower Slobbovia, or wherever Capp's whimsical and often complex plots led our heroic hillbilly. Li'l Abner was the unlikely son of tiny Mammy (Pansy) and Pappy (Lucifer) Yokum. Mammy was the industrious "sassiety leader" of backward Dogpatch who instilled honesty and All-American ideals in Li'l Abner. Pappy, in contrast, was an illiterate and hopeless parasite. From the inception of the strip, Abner was vigorously pursued by Daisy Mae, a beautiful Dogpatch damsel hopelessly in love with the bumbling, unappreciative and seldom amorous bachelor. Abner spent nearly two decades outracing Daisy in the annual Sadie Hawkins Day race but the couple finally married in 1952, a fictional event that captured national attention and was a cover story for Life magazine. Their only child, Honest Abe, was born in 1953. Li'l Abner generally had no visible means of support but he sometimes earned his living as a mattress tester. When not involved in worldwide escapades, he was engrossed by his favorite "comical strip," Fearless Fosdick. He interacted with many marvelous and fantastic characters creating language and situations which have become permanent parts of the American lexicon." "With the ground work firmly laid by the innovative promotions of the 1930’s, Daisy was ready to launch into its most successful promotion ever; the Daisy Red Ryder! It was also in the late 40’s that Daisy introduced the famous penny pack of BBs wound in a long roll of individual cellophane segments allowing a youngster to tear off as many packs as his finances would support." "During the years of World War II, companies such as Daisy were prohibited from using steel and other strategic materials for production of products such as BB guns which were non-essential to the American war effort. Instead, production was focused on items ordered under War Department contracts and sub-contracts. Gaskets were produced for AC Spark Plug Division, switches for Square D Manufacturing, ball races for Palmer-Bee, washers for Ligon Brothers, and dies for Bendix Aviation, Nippert Electric and Pilgrim Drawn Steel. Of the company’s total sales from 1942 to 1945, almost 24% were from products for the war and the balance were from non-steel toy products. Throughout history and numerous wars and conflicts, Daisy remains grateful to and proud of our employees who have so selflessly served our country, distinguished themselves and even made the ultimate sacrifice for freedom." "The 1950’s saw the loss of the two individuals whom, more than any others, guided Daisy to its position of dominance in the American airgun industry. On September 17, 1956 “Uncle Charlie” Bennett passed away at the age of 94. Up until a few weeks before his death he never failed to put in a daily appearance at the Daisy office. Less than 2 years later on January 24, 1959 E. C. Hough died at the age of 86. With their passing, Daisy lost the team that had guided it through three major world conflicts, three devastating economic downturns, and past countless competitors both large and small to emerge as the company whose name was synonymous with the BB gun. Daisy’s relocation to Rogers, Arkansas in 1958 represented the first major investment by industry in this highly rural region. It preceded the area’s ultimate development into the hub of Arkansas’ economy. Today the market area (now referred to as Northwest Arkansas) is home to numerous corporate offices including the world’s largest retailer and poultry producer." Bobby Blake, of his real name Mickey Gubitosi, was born in New Jersey and won a role in MGM's Our Gang series the age of five. As one of the more prominent children in the Gang, he gained attention for his cute good looks and his lovable, if somewhat melancholy, personality. In 1940, he took on the stage name Bobby Blake (though he continued to use the name Mickey Gubitosi in the Our Gang series for another three years) and began playing child roles in a wide range of films. He gained a good deal of fame as the Indian sidekick Little Beaver in the Red Ryder series of Westerns. His most recent claims of fame will remain unreported here. As for Little Beaver, the Red Ryder strip was so popular that he had his own series. Dell's Four Color Series #211 of January 1949 was the first issue, followed by 3 others through #332 of May 1951. Beavers' series then became independent with #3 (even though there had already been four issues) dated October-December 1951. The last independent issue was #8 dated January-March 1953, but there were eight more issues in the 4 color series. The last was dated January 1958. All 18 issues had painted covers. "Nobody really knows when Little Iodine first appeared. She turned up repeatedly, for years, in Jimmy Hatlo's daily panel, They'll Do It Every Time. The panel started in 1929, but Iodine wasn't there at the very beginning. By 1943, though, she'd become popular enough to get her own feature. So the closest we can come to pinpointing her debut is, she was probably first seen some time during the 1930s. [Here's additional info about the movie] "Running a mere 56 minutes, Little Iodine was the first of five "streamliners" produced by Comet Productions, a company formed by Mary Pickford, her husband Charles "Buddy" Rogers, and former Columbia exec Ralph Cohn. Based on the comic strip by Jimmy Hatlo, the film stars Jo Ann Marlowe as Iodine, the bratty daughter of Henry and Cora Tremble (Hobart Cavanaugh, Irene Ryan). The story gets under way when Iodine mistakenly believes that Mrs. Tremble is romantically involved with French professor Simkins (Leon Belasco). Iodine's misbegotten efforts to break up the nonexistent affair causes friction between her father and his bombastic boss Mr. Bigdome (Emory Parnell), but the little darling comes to the rescue at fadeout time. Thanks to legal entanglements, Little Iodine has never been released to television, but that's no great loss." "[The] film was intended for an earlier release date but was set back to 20 October 1946 because of a polio epidemic which was restricting film attendance of juveniles throughout most of the United States." In all her comics venues, Little Iodine was signed by Hatlo and produced under his supervision, in his old-fashioned bigfoot style. His main assistant/ghost was Bob Dunn, who had previously worked for Rube Goldberg. Dunn took over in 1963, when Hatlo died. Others who worked on it include Al Scaduto (who inherited the operation from Dunn), Bill Yates (Redeye, the small society) and Hy Eisman (Popeye, Katzenjammer Kids). All maintained the Hatlo style, but with Hatlo gone, it was no longer the same. And the style itself looked more dated every year. The Little Iodine strip ended in 1986. They'll Do It Every Time is still running (over Scaduto's signature), but Iodine hasn't been seen there in years." The strip has won many Reubens over the years - Won Best Single Panel in 1957 & 1959 for Hatlo, Bob Dunn won it in 1968 & 1969 and again Dunn with Al Scudato in 1979 then Al Scudato alone in 1991. "Cartoonist Jimmy Hatlo, a jovial, bigdomed man who explodes into mock-temper tantrums, makes more than $250,000 a year by illustrating his simple theory that things always happen at the worst possible moment. Last week Hatlo, whose syndicated cartoon "They'll Do It EveryTime" runs in 637 dailies around the world, had real-life facts to back up his fiction. On its front page, the Denver Post reached the peak of a campaign to prove that dogs are "man's best friend." The Post was all out to block an anti-dog ordinance in the city council that would virtually force dog owners to..."
Lulu wants Tubby to find out who gave her pop a cigar that exploded in his face. Lulu and Tubby eat everything out of each other's refrigerators. Wilbur pretends to have a magic wand that makes Lulu disappear. Lulu tells Alvin about when Hazel turned her into a water pipe. Tubby's cousin Jefferson steals Tub's clothes at the lake. "Marjorie Henderson Buell signed her cartoons with the unpretentious “Marge”, but behind the familiar name was an astute businesswoman and groundbreaker in female cartooning. The creator of Little Lulu, Marjorie took her captivating comic girl from a one-panel cartoon in 1935 into an international marketing sensation, all the while keeping the rare option of creative control for herself. Born in Philadelphia, Pennsylvania in 1904, Marjorie Lyman Henderson must have been a natural cartoonist. By age 10, she was drawing and selling paper dolls to her friends and created a Christmas card line that sold rather well. Her first cartoon was published at the tender age of 16 in the Philadelphia Ledger, a single panel of a flower girl tossing banana peels down the aisle rather than flower petals, with the result of the bride and bridesmaids slipping high in the air. The cartoon was strictly a sight gag with no wording necessary. After completing high school, Marjorie became a professional cartoonist, finding publication for her prolific work in the high-level magazines of Life, Judge, The Saturday Evening Post and Collier’s. It was this adeptness at humour that brought The Saturday Evening Post to call on Marjorie a few years later. They asked her to join the prestigious Post to develop a comics panel to replace the outgoing “Henry” comic, drawn by Carl Anderson [which had been picked up by King Features]. Marjorie drew a long-legged little girl, much like the ones in her earlier freelance work, with black corkscrew curls, elongated dots for eyes and an impish personality. (Marjorie thought she looked much like the character when she was a child.) 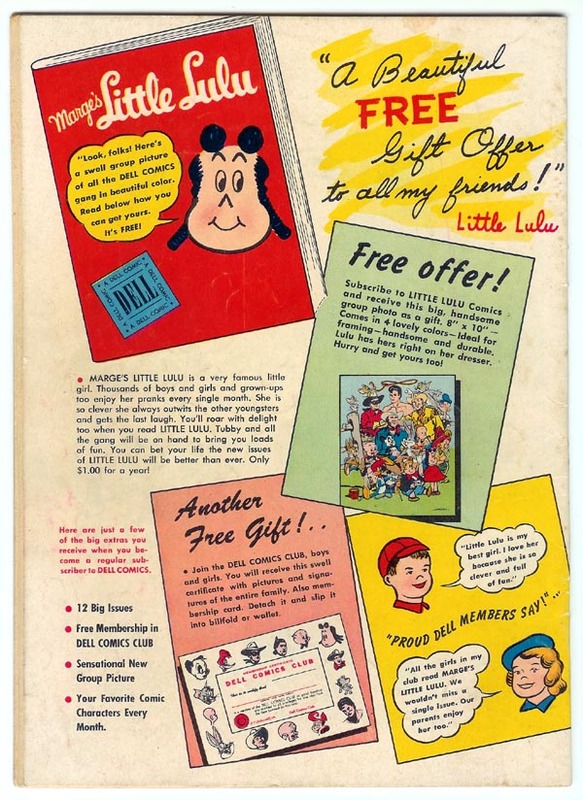 The magazine editors named her distinctive comic character Little Lulu. The mischievous, fun-loving Little Lulu debuted on the last page of the prestigious Saturday Evening Post on February 23, 1935. Marjorie’s signature became the single name of “Marge”. By that time, Marjorie was 31 years old, married to C. Addison Buell and had two sons, Fred and Larry. She had already been in the cartoon business for years. For 10 years, Little Lulu enjoyed its position in the Post pages, the caption-less comic a hit with readers. Since Marjorie had kept rights to her cartoon, she was able to promote and license Little Lulu herself. During the 1940s, the cartoon favourite was abundantly available in merchandise such as greeting cards, games, toys, colouring books, scarves and much more. One of Little Lulu’s most prominent advertising gigs was as spokestoon for Kleenex ®. The smiling character promoted the tissue brand for 16 years, from 1944 to 1960, appearing on boxes, displays, in magazine ads and even on buses and giant billboards in downtown New York City. Throughout, Marjorie kept and used her right of approval on Little Lulu ads. It was in comic books that Lulu truly found her place. The first issue of Marge's Little Lulu appeared in 1945 from Dell Comics In a popular series within the series, Lulu told stories to her younger neighbor, Alvin, about a poor little girl who picked beebleberries in the woods, and had adventures with Witch Hazel and Little Itch. Marge's Little Lulu was published regularly until 1984. In 1972, it underwent a name change. Western Publishing, which at that time was publishing the comic under its Gold Key imprint, solved the royalties problem in a more healthy way than Famous Studios had — they bought the character from Buell, and thereupon dropped "Marge's" from the title. Despite the name, Marge never had much to do with the comic book. From the beginning, it was written and laid out by comic genius John Stanley, with finished drawings provided by Irving Tripp. Stanley has achieved widespread acclaim for his work on such disparate comic books as Melvin Monster, Thirteen Going on Eighteen, Tales from the Tomb, and the comic book version of Nancy & Sluggo — but it is his work on Little Lulu for which he is best known. Marjorie died of lymphoma on May 30, 1993, at age 88. Renowned for her business abilities and cartooning skills in what was most certainly a “man’s world”, Marjorie Henderson Buell created an endearing, impish character and molded her into an international triumph. Marjorie was an inspiring role model for cartoonists and entrepreneurs alike. Just look at what a few pencil strokes on a piece of paper and a dash of personality can do. In 1995, Lulu starred in a second series of animated cartoons — this one produced for cable TV and first aired on HBO, with Tracey Ullman providing Lulu's voice — proving that Lulu still has what it takes to make an audience laugh." 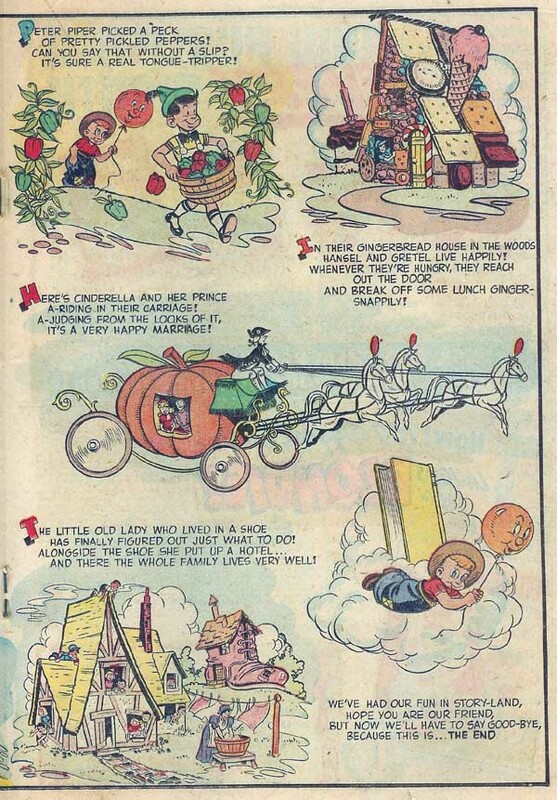 This is one of the early That Awful Witch Hazel issues, which replaced the Lulu and Alvin Storytelling stories for the fantasy element in Little Lulu. While fun, I like the storytelling approach better, as the fantasy makes sense in that she is making up a story she is telling to Alvin while the Witch Hazel stories are "real" in much the same way that the Little Men from Mars are in the Tubby comic. If just doesn't feel right to me. It kind of crosses a line and you lose the element of "these are normal kids" that was there earlier, imo. This book is Part II of our triumvirate of Joe Palooka related books after we saw Humphrey earlier. To complete the coverage about Ham Fisher, here's the story of how Joe Palooka came to be syndicated as retold by Coulton Waugh. "After World War I he [Ham Fisher] got a job as all-around cartoonist for the Wilkes-Bare Herald; about that time his cartoonist passion crystallized into a firm determination to do a comic strip. "Joe Palooka" came to Ham Fisher suddenly, but quite naturally, one day. He had been interviewing a mild-hearted, childlike prize fighter, a type not uncommon in the fight game, for a man who knows he can lick practically anyone he meets is likely to develop a bland tolerance of spirit. He started at once; the strip was immediately turned down by all the syndicates. Fisher wouldn't give up and kept on working at Wilkes-Barre, even starting a newspaper himself. The paper folded. Was he discouraged? Certainly; but very wisely he determined that he would keep driving ahead with the real thing in which he was interested, "Joe Palooka." He took his continuity and drawings and arrived in New York in 1927, with $2.50. An old, old story. Fame, in real life, is extremely hard to come by. Once more Fisher's old pattern was repeating; apparently it was a permanent one. He had a beans-and-coffee job in the advertising department of the New York Daily News, and his spare time was spent in resubmitting "Palooka" to the syndicates and being turned down again. A clever move that demonstrated his political talent was the real turning point. He got a job at McNaught Syndicate. Here he was only a few feet from the office of Charles V. McAdam, general manager. It worked. Ham was a salesman, among other things. McAdam, a bit reluctantly, gave in; said he would try out "Palooka," later. Not good enough. Fisher, with the taste of success in his mouth, determined he would go to the actual newspapers and sell "Joe" to them the hard way. Huh, so he thinks he's a salesman! O.K., he would prove it; he took another strip, "Dixie Dugan," which at that time had only two papers, and took to the road. In forty days, he had landed over forty papers for "Dixie." All ready now for "Palooka" - but then another nasty shock, perhaps the worst jolt yet. "Boy, you ARE a salesman! O.K., go right on selling! Of course - not that 'Palooka' thing; you've got to give'em something they can use." That was a rough one. Ham's strip was, however, about a fighter, and Ham was a fighter. He'd been through too much to go anywhere but straight ahead. He used a bit of the old generalship, waited until the boss went off to Florida on a vacation - then bang, sock, he was out on the road with "Palooka," selling for his life in all directions. The boss came back after three weeks to find "Palooka" sold to twenty papers. The long battle was over. The syndicate went right to work, and all over America the rolling presses printed the two new words, soon famous. With the strip's full emergence in the New York Mirror, Ham Fisher had won his first battle." That's one way to get syndicated! "After three months at AP Capp resigned in disgust and headed for New York. There he would meet yet another important influence, Ham Fisher, creator of the boxer comic strip Joe Palooka. The legend is that Fisher met Capp on the street, winning a bet with his chauffeur that Capp was carrying cartoon strips under his arm. Fischer hired him as ghost for Joe Palooka, at a rate that was roughly half what AP had paid. Capp later wrote of his impressions of Fischer in The Atlantic Monthly: "It was my privilege, as a boy, to be associated with a certain treasure-trove of lousiness, who, in the normal course of a day, managed to be, in dazzling succession, every conceivable kind of heel. It was an advantage few young cartoonists have enjoyed --or survived." ("I Remember Monster."). 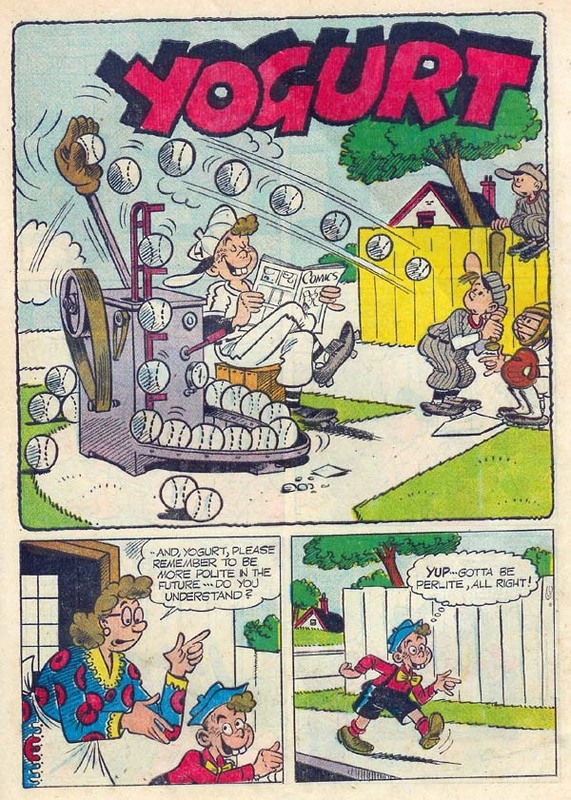 Later on around 1950, Capp had Li'l Abner suddenly infused with cartoon genius but being forced to work for a horrible cartoonist based directly on Fisher. Fisher in turn detested Capp. He always claimed that he stole the Li'l Abner characters from him when in fact, Capp developed those hillbilly characters based on the folks he saw when he traveled to the mountains of West Virginia [i don't think it was West Virginia, see the Li'l Abner entry and the discussion by Elliott Caplin, Al Capp's brother] as a youth. To pull away from the negativity, I'll include a complete story here. Little Scouts # 3 - Purchased from ? Here's another forgotten series but then again it really was only ever just a flash in comic history. Unsurprisingly, I could turn up but little about the series and its creator. It leads me to wonder why and how the editor at Dell selected this feature to include in the Four Color series. Indeed, Little Scouts followed the same trajectory as Little Beaver in that it started as part of the FC series, spun off to its own title and ended its run within the FC series. Specifically, The Little Scouts was published from no. 321 (Mar. 1951) to no. 587 (Oct. 1954). The numbering proceeds as follows: no. 321, 2-6, 462, 506, 550, 587 for a total of 10 issues before falling into oblivion. Roland Coe's father Roy Coe was born in Illinois in December 1878. Roy's mother Mary was born in March 1847 in New York. Roland had a sister Nettie J. Coe who was born in September 1875 in Illinois. The family lived in Marshall County prior to moving to Havana. Roland Coe was born on May 24, 1907, in Havana, Illinois, a hamlet of some 3000 people, located in the central part of the state. From his father, an amateur artist of fair ability, Roland inherited a talent for illustrating and cartooning which he developed so diligently that early in life his work brought him into the ranks of professionals. Finally, on July 9, 1934, the “New York Post” was fortunate enough to secure Coe’s services, and his CROSSTOWN CARTOONS, drawn exclusively for the “Post,” gained enormous popularity. His clean, wholesome, and human art increased his admirers to a number comparable with those of the world’s most distinguished artist-humorists. During his career, Coe lived in Hamburg N.Y., married to Doris Judd then went to Amherst, Mass., and died 1954. This is possibly the reason the series ended in 1954 with his creator's death at the young age of 47. Any idea the readership of Little Max comics? Joe Palooka had a big following so I wonder if it filtered down to the secondary characters. As a fan of Joe Palooka comics, I found the story of Ham Fisher very interesting. Keep up the great postings. It is unlikely in the extreme that Daisy Mae was modled after Veronica Lake, unless Capp knew her when she was a 14 year-old. Daisy Mae appears in 1934, Veronica's first screen appearance is 1939 - in a bit part, and she doesn't really become a star until 1942. But, otherwise - excellent posts, Scrooge. - Al Capp, child stalker! I can't say that I went back and checked the facts, can I? ... even though I am not surprised at the excellent points you make. Now, Coulton Waugh's book came out in 1947 by which time, Miss Lake was a star (in 1947, she was actually Mrs. De Toth by the way, married to André De Toth, a Hungarian actor who emigrated to the US in 1942). As a miscue, I put her photo next to the early Daisy Mae and maybe I should have put her close to the later Daisy Mae once she'd evolved in her recognizable form. Anyway, I couldn't resist showing her on that panther rug. Great comments. The origin and history of the Lone Ranger character reproduced below comes from the Old Coral website. "George Washington Trendle had acquired radio station WXYZ in Detroit in 1929. Hoping to turn a respectable profit, Trendle thought about developing a radio show using a hero based on a combination of Zorro and Robin Hood. THE LONE RANGER hit the airwaves in 1933. Initially the show was heard on WXYZ, and later, over the Michigan Regional Network. During the early years, WXYZ's jack-of-all-trades James 'Jim' Jewell did scripts, directed and even did roles on the program. Supposedly, Jewell even did the Lone Ranger role in a 1933 broadcast. Later, Trendle hired a talented radio writer named Fran Striker who further developed the characterization and scripts which left Jewell to concentrate on directing. By the mid-1930s, the program was also running on Chicago's WGN and New York's WOR. That trio of stations (WOR-WGN-WXYZ) became the Mutual Broadcasting Network. Soon after, the LONE RANGER show was picked up by the Don Lee Network in California. While there were several performers who portrayed the Lone Ranger in a few early broadcasts, James Jewell hired Michigan native Earle W. Graser and he became the radio Lone Ranger from 1933 through early 1941. Graser did his last LR broadcast on the evening of April 7, 1941. The following day, April 8, 1941, he fell asleep while driving and was killed in an automobile accident in Farmington, Michigan. LR announcer Brace Beemer took over Graser's role, and the five episodes which were broadcast on April 9, 11, 14, 16 and 18, 1941 have become known as "the Transition Series". 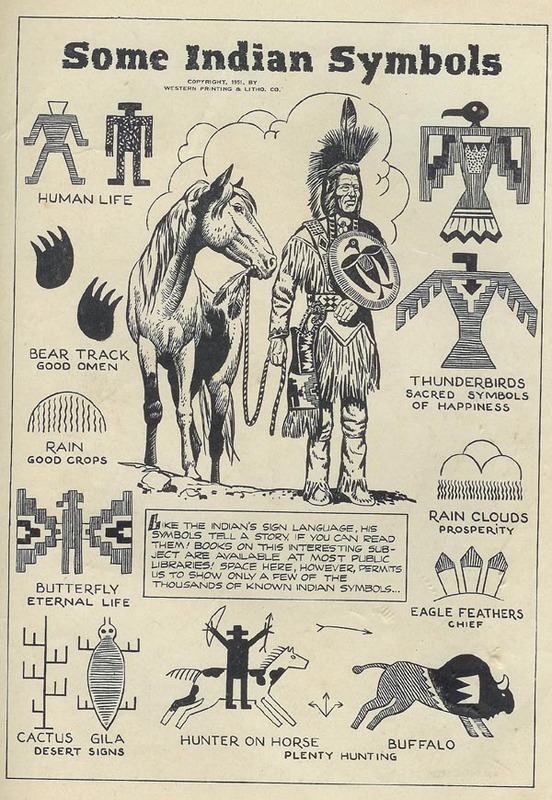 During that five program changeover from Graser to Brace Beemer, Tonto did most of the work while Beemer played a wounded and injured LR who uttered a few moans and grunts and wrote instructions to his trusted Indian companion. On April 21, 1941, in an episode titled "Outpost in the Desert", Brace Beemer (and his booming bartone voice) settled into his new job as radio's Lone Ranger, a role he would play for thirteen years until the final live broadcast on September 3, 1954. Brace Bell Beemer was born in Mt. Carmel, Illinois on December 9, 1902 and passed away March 1, 1965 while playing bridge with friends. By 1937, the radio program was popular, and Trendle wanted to see if the character was saleable to Hollywood. In June, 1937, a contract was signed between Trendle and Republic Pictures for a cliffhanger based on the Lone Ranger and Tonto. Trendle/The Lone Ranger, Inc. was paid $18,750.00 plus 10% of any rental share above a $390,000.00 minimum. The agreement also allowed Republic to release a condensed version of the serial (which they did in 1940 with the feature HI-YO SILVER). The main issue between Republic and Trendle was that the Lone Ranger would unmask in Chapter 15, revealing himself as Allen King (played by Lee Powell). Trendle didn't like this unmasking, but the contract gave Republic final authority on the -script and characterizations. Apparently, any issues/arguments were solved when Republic gave Trendle the music from the serial (and much of that music was used by Trendle in subsequent LR radio broadcasts). Republic's budget for THE LONE RANGER was $160,000.00, and the final negative costs amounted to about $168,000.00. Production on the serial began in late 1937, with exterior location filming done at Lone Pine, California. Released in February, 1938, THE LONE RANGER serial was a huge financial success for both Republic and Trendle. The serial also created new interest in the radio version and an additional hundred or so stations picked up the show. King Features even came out with a comic strip. During the Summer of 1938, negotiations began for a sequel, and in September, a contract was signed with Republic agreeing to pay Trendle a substantial $40,000 against 10% of the gross. This time, Trendle did not give approval for a feature version. However, Republic still had authority over the -script and screen characterizations (and star Bob Livingston would frequently mask and unmask). The working title of the sequel was THE LONE RANGER RETURNS, but was changed to THE LONE RANGER RIDES AGAIN. Negative costs totalled around $214,000.00, with filming initiated in late 1938, and theatrical release in February, 1939. Both serials were directed by the team of William Witney and John (Jack) English, the dynamic duo generally recognized as the creators of the finest cliffhangers. Republic also continued negotiations with Trendle for future use of the LR character, but apparently the price was too high and/or the contractual terms were too restrictive." The first actor to act as the Lone Ranger on the screen was Lee Powell, who was the Lone Ranger only for the first serial. Here he is pictured with the full mask on. "Lee Berrien Powell was born on May 15, 1908 in Long Beach, California. Powell was a pretty good action hero, and had demonstrated same as the star of two classic Republic serials of 1938, THE LONE RANGER and THE FIGHTING DEVIL DOGS. There's a bit of eerieness about Powell's starring role as a Marine in THE FIGHTING DEVIL DOGS, as he would be wearing a real Marine Corps uniform during World War II and fighting his way through various Pacific island jungles. He was offered a five-year term player contract at Republic for $150.00 a week, six-month options, escalators, etc., which was typical studio enslavement at the time. Republic was planning a sequel to the immensely popular THE LONE RANGER chapterplay. But Powell or his agent made a wrong business decision. They refused the deal and demanded more, and Republic said "bye bye". Bob Livingston, a member of Republic's Three Mesquiteers cowboy trio and already under contract to the studio, was given the starring role in the sequel, THE LONE RANGER RIDES AGAIN (1939). In 1939, Powell hired on with Grand National Pictures for a new western series. During the mid to late 1930s, Grand National had several western/outdoor adventure series - there was Dorothy Page as the "Singing Cowgirl", James Newill as Renfrew of the Royal Mounted, and western songster Tex Ritter. But Grand National was in financial trouble and would soon go 'belly-up' ... and the new trio series with Powell would consist of one mediocre film. Unable to land much work elsewhere, Powell signed on with the Barnett Brothers Circus, and later, with the Wallace Brothers Circus, billing himself as the "The Original Lone Ranger of Talking Picture Fame", to attract a larger audience. Wearing a costume similar to his Lone Ranger serial outfit, Powell would gallop into the center ring astride a white horse and shout "Hi-Yo Silver" while the orchestra played the William Tell Overture. However, the LR's owners went to court to halt Powell from using the Lone Ranger name/likeness and capitalizing on their property. While working for the Barnett Brothers Circus, Powell met Norma Rogers, the daughter of the owner, and they married in 1940 or 1941. Other than a few western bit parts, Powell's only substantive role came when he portrayed Captain Roka and helped Buster Crabbe fight Ming in the cliffhanger FLASH GORDON CONQUERS THE UNIVERSE (Universal, 1940). Then came the short-lived Frontier Marshals series at Producers Releasing Corporation (PRC), which consisted of six horse operas filmed in late 1941 and early 1942. By then, Powell's career was in a real tailspin, as he was billed third behind western songsters Art Davis and Bill 'Cowboy Rambler' Boyd (not the William Boyd of Hopalong Cassidy fame). He enlisted in the Marines on August 17, 1942 in Los Angeles, and reported to the Marine base at San Diego, California as a recruit. After boot camp, he was assigned to the 2d Battalion, 18th Marines (Engineers), 2d Marine Division at Camp Elliott, California. Powell saw action at Tarawa (in 1943) and Saipan (in 1944). On July 30, 1944, Sgt. Lee Powell, serial number 442926, died on Tinian (Marianas Islands). World War II era reports indicated he was killed in action, and that information has been carried forward to current times." 1) "Tinian was a key island in the Pacific and an airbase would be constructed there. On August 6, 1945, a B-29 Superfortress bomber named the Enola Gay would take off from Tinian on its atomic bomb run to the Japanese mainland and a city named Hiroshima." 2) In his book is STARS IN THE CORPS - Movie Actors in the United States Marines, James E. Wise, Jr. narrates that "Sgt. Lee Powell lived through some of the bloodiest battles of the Pacific War. But then, on the same day that the Tinian battle ended, he died of acute poisoning. Newspapers at the time assumed he had been killed in action, but Sergeant Powell's USMC files report not only the alcohol poisoning, but some sort of "misconduct", the nature of which was "undetermined". Hypothetically, it must have had something to do with cutting loose a bit too much after having survived the hellish battles in which he was involved, perhaps by celebrating with vast quantites of methyl alcohol. Even small amounts of this highly toxic substance can kill; it can only be hoped that the courageous and successful warrior at least got to have one last good party with his buddies. But the United States's erstwhile masked man carried the mystery to his grave. He was buried in the Marine Cemetery on Tinian and later, at the request of his father, moved to the National Cemetery of the Pacific in Honolulu. Sergeant Powell, age thirty-five when he died, was posthumously awarded the Purple Heart, the Asiatic-Pacific Area Campaign Medal with two stars, and the Victory Medal World War II. The latter two awards were sent to his widow in September, 1948." Herman Brix (1909- ) - was the shot put champ in the 1932 Olympics and the hero in THE NEW ADVENTURES OF TARZAN (1935), SHADOW OVER CHINATOWN (Victory, 1936), HAWK OF THE WILDERNESS (Republic, 1938) and DAREDEVILS OF THE RED CIRCLE (Republic, 1939) cliffhangers. Later, Brix changed his name to Bruce Bennett and appeared in a variety of movies (such as Humphrey Bogart's THE TREASURE OF SIERRA MADRE) and 1950s-1960s TV shows. Floyd Taliaferro Alderson (or Alperson) (1895-1980) - had a bunch of different screen names ... as Wally Wales, he was a cowboy star in silents and early 1930s oaters ... in the mid 1930s, changed his moniker to Hal Taliaferro and did supporting roles and bit parts in scores of westerns and serials until the 1950s. As the serial progresses, four of the five Rangers are killed off. The first to die was George Letz as Jim Clark; then came Hal Taliaferro as Bob Stuart; Lane Chandler as Forrest was the third; and finally, Herman Brix as Bert Rogers ... this left Lee Powell as Ranger Alan King --- the Lone Ranger. A variety of sources mention that the original shooting -script had Lane Chandler, as Ranger Forrest, as the Lone Ranger. Farrell published a healthy 26 issues of the Lone Rider. This series, I don't think, is not known for anything in particular. I did like the art from the Iger studio in this issue except for the second Lone Rider story (of which I will show no scans). It has the most studio feel to it as you can easily notice different hands across different pages. The feeling is there on the first story but it's far less obvious. One of the reason the series is probably long forgotten by most is that there is no lack of masked western crime fighters. First, compare the Lone Rider with the picture of Lee Powell as the Lone Ranger with his full mask on in the previous post. Then we can move to Atlas and any issue of Black Rider or ME's Durango Kid just to name a few. Moreover the Lone Rider moniker isn't original either. 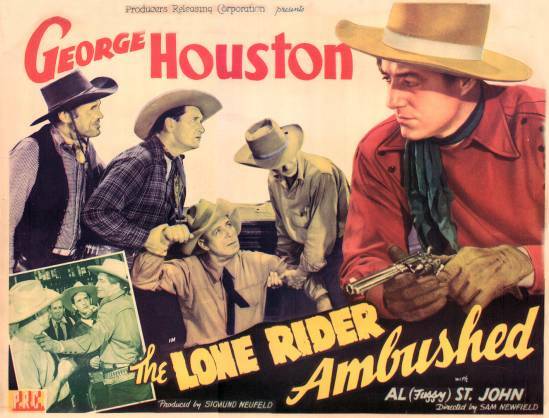 First there were 11 Lone Rider movies shot by PRC between 1941 and 1942, starring George Houston as the Lone Rider a.k.a. Tom Cameron. Later on, Bob Livingston took on the star role after Republic let him (but before he was the second Lone Ranger, in The Lone Ranger Rides Again). More of it is reprinted in The Complete Jack Kirby : 1917-1940 but I don't own a copy. In the Lone Rider, the first solo feature created (in 1938) by Jack Kirby, rancher Jim Larrimore donned a black hood to disguise his face as the heroic Lone Rider, receiving second billing to his white horse, Lightning. He battled characteristically Kirbyesque villains as the 50,000 year old immortal telepath Dr. Chuda. What's interesting to me is that Farrell's Lone Rider's horse is also Lightning and that therefore there might be a connection between the two versions even though they are separated in time by over 10 years. I say 10 years because the Lone Rider by Kirby was also published by Eastern in Famous Funnies from issue 63 in April 1939 to issue 76 in November 1940. "As an “in-betweener” at the Max Fleischer studios, Jack worked on Popeye cartoons. After a few months however, labor unrest erupted at the studio and Kirby decided to get out before he found himself on strike and to seek employment elsewhere. That employment was found at the Lincoln Newspaper Syndicate, where he began his stint as a political, gag, and strip cartoonist. While working for Lincoln, Kirby produced a huge volume of work, including ongoing strips, panel gags, and “fact” panels. Lincoln was a small operation with few clients, and some of the strips Kirby created only appeared in a few newspapers while others may not have been published at all. All were penciled, inked and lettered, and most were written by him and the different styles reflect Kirby’s own experimentation at this stage. Whereas The Black Buccaneer strived for a “wood-cut” effect, Abdul Jones was more in keeping with the style of contemporary humor strips. Cyclone Burke was among his first ventures into science-fiction. Socko the Seadog, created by a Lincoln co-worker as an obvious Popeye emulation, proved to be Kirby’s most popular strip of the period. And the Lone Rider, done for another syndicate of the time, marked Kirby’s first Western comic strip. Interestingly, Al Williamson during the 1997 Kirby Tribute Panel recalls the Lone Rider as one of the earliest example of Kirby's work he'd seen. "MARK EVANIER: The person I think whose association with Jack dates back the most is Al's. You had the experience of inking Jack at a time when you weren't an inker. AL WILLIAMSON: That's correct. I went up to Harvey Publications around 1957, give or take a couple of years. The Editor, Joe Simon, didn't have any work for me, but he had a Jack Kirby five-page science fiction story, and asked if I would like to ink them. They inked themselves; I had no problem. I took them in, they liked them, they gave me three or four more, and that was it. I don't think they were printed right away, because I never saw them until the 1960s. MARK: You were familiar with Jack's work already? AL: Oh, sure. I lived in South America, in Bogota, Colombia. They didn't do any comic books, but they imported a lot of comics from Argentina and Mexico. The very first Jack Kirby work I ever saw was a black-&-white reprint of a character called Cosmic Carson, and I thought it was just great, just wonderful. It was translated into Spanish. Then I discovered American comics, which didn't get down there too often, maybe one or two a month. I picked up my first American comic book, which was Famous Funnies, which had a one-pager called "The Lone Rider." That was the second strip; I knew it was the same artist. I discovered two friends who loved comics, and they were visiting from Panama, where they could get American comics much easier. They sent me two comic books: One was an issue of Young Allies. It was just incredible. All I remember about it was a double-page spread of the most exciting, exquisite fight scene I've ever seen. I've never seen that comic book since; I don't know if it exists, or if it's my imagination. If anybody has it, I'd love to see it. Y'know, he just grabs you, right from the beginning. I think he and Wally Wood are probably two of the finest comic book artists that ever lived. Inking his work was quite a thrill for me, because first of all, he was the first artist I ever inked. He did all the work for me; I had no problem at all. I've been credited with inking a couple of covers and some jobs that I didn't ink. The only jobs I ever inked of Jack Kirby's were those science fiction stories: "The Three Rocketeers." So my apologies to whoever inked those panels or those covers; they should've gotten credit." Enough of the digressions. Here are some pages.